A “life-threatening” storm is poised to hit the US east coast, bringing blizzard conditions and a blanket of heavy snow. Meteorologists were predicting snowfall totals as high as 20in (50cm) in New York City from the storm’s start late on Monday through to Tuesday evening. The National Weather Service warned that blizzard conditions of wind gusts over 35mph (56kph) and low visibility would extend from the Philadelphia area to Maine. The weather service’s office near Philadelphia called the storm “life-threatening” and warned people to “shelter in place.” Coastal flooding was also predicted. About 5,000 flights were cancelled as of late Monday afternoon, Amtrak cancelled and modified services up and down the Northeast Corridor and motorists were urged to stay off the roads. In New York City, the above-ground portions of the subway system were being shut down from 4am on Tuesday. Connecticut governor Dannel P. Malloy imposed a statewide travel ban beginning at 5am. The dismal forecast prompted early decisions to close schools on Tuesday in New York City, Philadelphia, Boston and many places in between. 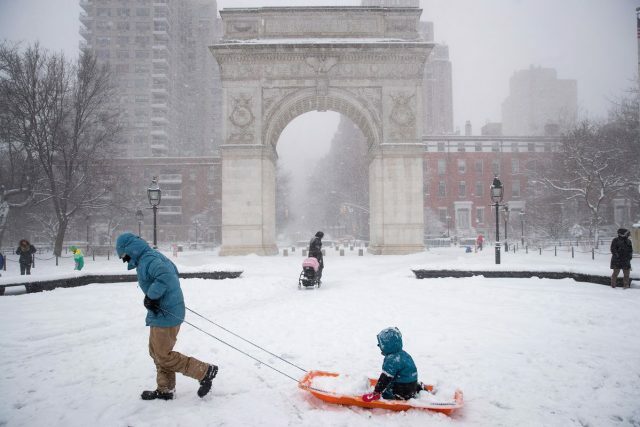 New York City mayor Bill de Blasio urged residents to avoid unnecessary travel and help keep the roads clear. “We’re preparing for a significant storm on Tuesday, and New Yorkers should also prepare for snow and dangerous road conditions,” de Blasio said. The storm comes a week after the region saw temperatures climb into the 60s. Spring officially starts on 20 March. Bank teller Jana White said her plans for riding out the storm include “lots of hot chocolate and a couple of sappy movies.” The 23-year-old Trenton, New Jersey, resident said she expects to get Tuesday off work. On social media, Americans used the hashtag #snowmageddon2017 to vent their feelings about the impending storm. The heaviest snowfall was expected on Tuesday morning through the afternoon, with snowfall rates as high as 2 to 4in per hour. Coastal flood warnings were in effect from Massachusetts to Delaware. Boston could get 12 to 18in, with isolated amounts of up to 2ft across northeastern Massachusetts. In Philadelphia, where up to a foot of snow could fall, crews began treating some area roadways on Sunday. Farther south in the nation’s capital, where the National Cherry Blossom Festival is scheduled to start Wednesday, snow accumulations of 6 to 8in were expected. That led German chancellor Angela Merkel to postpone her trip to Washington for her first face-to-face meeting with president Donald Trump. Merkel had been scheduled to arrive late on Monday night for meetings with Trump on Tuesday. The White House said the meeting was rescheduled for Friday.